Across the Port Phillip and Western Port region, thousands of volunteers, typically as members of Landcare, Friends of and community environmental groups, actively care for our land, water, native plants and native animals. Their work helps protect public and private land from erosion and salinity, our creeks, coasts and wetlands from pollutants and our native plants and animals from weeds, pest animals and other threats. This caring is a voluntary contribution to the future health of our environment. Enabling people to take part in community activities is one of the PPWCMA’s key objectives. Funded by the Victorian Government, the PPWCMA’s Regional Landcare Coordinator, Barry Kennedy, supports these groups to develop the tools and resources they need to attract and keep people involved in environment efforts. The work of the Regional Landcare Coordinator is guided by the PPWCMA Landcare Support Plan (PDF – 2.6MB). Contact the Regional Landcare Coordinator. Landcare Groups are typically formed by neighbouring private landholders who share a common desire to protect the natural assets on their properties and in their local district. They work together to tackle issues such as managing weeds or rabbits, reducing the impacts of erosion, or to contribute to broader landscape issues such as vegetation connectivity. Many of the Landcare groups in this region have come together and formed Landcare networks as a way to share and learn from each other and work together on large-scale initiatives. Friends groups typically consist of people who share an interest in protecting or improving the integrity of a local place on public land. This might be their local bushland reserve, creek or an endangered species found near where they live or like to visit. 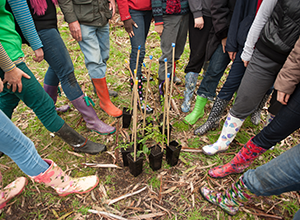 To find a friends group, your local council is a good place to start, but many also have their own website or are listed on the Victorian Landcare Gateway. Coastcare groups are formed by volunteers seeking to protect or improve coastal and marine environmental assets. These groups tackle problems like dune erosion, loss of native plants and animals, storm water pollution, weeds and control of human access to sensitive areas. To find a Coastcare Group, visit the Coastcare website.